Stevenage have appointed former Arsenal scout Gary Smith as their new manager. The 43-year-old, whose only managerial experience is with Major League Soccer side Colorado Rapids, replaces former boss Graham Westley. Former England internationals Paul Ince and Martin Keown had been linked with succeeding Westley, who left to join Stevenage's League One rivals Preston. "I believe it's a fresh, exciting appointment in the Stevenage way," said chairman Phil Wallace. Smith has made an impressive start to his managerial career, having guided Rapids to the MLS Championship Cup in 2010 and the play-offs in 2011. He started his coaching with Wimbledon and had spells with Wycombe, where he spent the bulk of his playing career, and Watford before joining Arsenal's backroom staff. 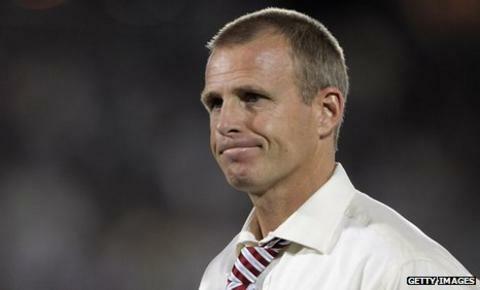 The Gunners sent Smith to Colorado, who are owned by Arsenal's largest shareholder Stan Kroenke, to strengthen their American coaching links and he impressed enough to be installed as Rapids' head coach in 2008. He left the club late last year, however, when his contract was not renewed after a falling-out with club officials. Wallace added: "We want young management who are motivated to succeed. "Gary is young but he has already won silverware at the highest level possible in the US. "Now he wants the opportunity to make his mark on the English game." Defender Mark Roberts has been in temporary charge since Westley's departure, collecting seven points from three games to leave Stevenage in the last of the League One play-off places. Wycombe midfielder and BBC sport columnist Matt Bloomfield added: "Gary Smith was the youth team coach at Wycombe before he went out to America. "The first thing that stands out is that he had total respect from all of the lads, from the youth team boys through to the senior professionals. "He would see things in first-team matches and I could ask him questions about my own game. He is a very good coach and the Stevenage players will enjoy his training sessions."